More than 75% of Americans have some kind of coffee maker in their home, and no matter what style – drip, percolator, French press – we have more of them now than we did even ten years ago. When was the last time you went to someone’s home and they had no way of making coffee? The market has been flooded with coffee makers, and at the under $200 price point, they are in fierce competition to give you your coffee as fast and as easily as possible. If you’re hyper-picky about the taste of your coffee, these machines may not be right for you, but if you’re willing to be flexible on taste in exchange for speed and convenience, read on. Our reviews can be the first “filter” in your selection process. 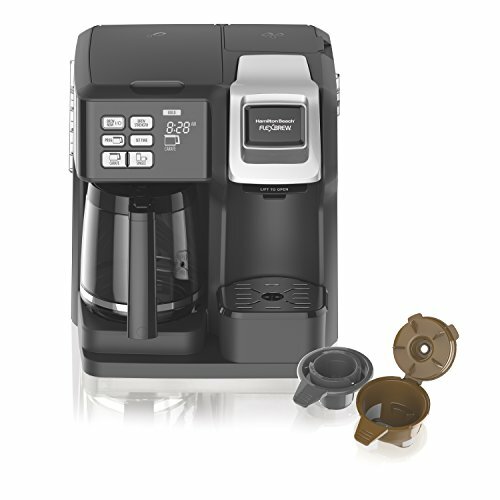 Keurig has come a long way since it created the single serve coffee machine market and the Keurig K575 is another reason why. It has a huge, easy-to-fill 80-ounce removable water reservoir and can brew to fill five different cup sizes and three different carafe sizes. Its touch screen controls are intuitive and allow you to program it to have your morning coffee waiting for you. Forget to program it and you only have to wait about a minute to get a single cup in your hands. It will accommodate over 400 varieties of pods, including a refillable one for your own grounds, thus ensuring that everyone will be happy with their hot beverage. This machine could be more convenient only if it were telepathic. The only complaints anyone has are around the taste of the coffee, but unless you’re the type who flies in hand-picked beans from Ethiopia, this machine will make you very happy. The Oxo 8710100 beats out our Top Pick in one area – taste. Coffee enthusiasts who carefully choose and then grind their own beans every morning consistently rave about the terrific tasting coffee produced by this machine. 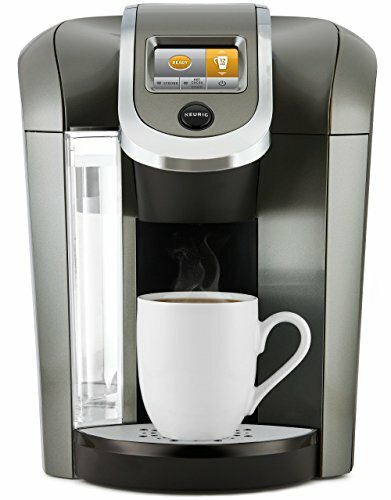 Also on par with our winner, this device is programmable and offers a choice between single serve and carafe-filling. But it’s a little more expensive and doesn’t quite meet the expectations you’d have as a result. This machine can’t match the variety of brew sizes offered by our Top Pick Keurig. Many users report leaking unless you wait quite some time before removing your cup or carafe, thus losing points for the speed you’d assume it had. And the reservoir is a challenge to fill. Most of the complaints are of a nit-picky variety, forcing you to decide if the extra minor hassles are worth a better tasting coffee. The Hamilton Beach 49976 is a smokin’ deal. It is markedly less expensive than our Top Pick or Runner-Up, even though it comes with many of the same features. 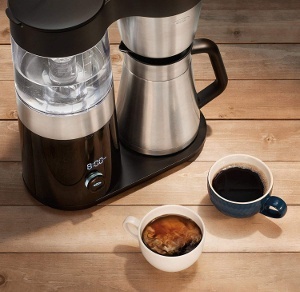 You can choose single serve or 12-cup carafe, grounds or pods, and it’s programmable. It does brew a little more slowly, but not so much that you’d notice unless you were standing over it with a stopwatch. It has separate reservoirs for each side, which nudges you toward using fresher water more often. And it’s very light, which is nice if you’re pulling it out from under your upper cabinets to refill. What’s the catch? You won’t have it forever. It’s prone to a short lifespan, especially the single serve side. And your complaints to HB customer service will likely be unheard. But this combination of features and low price should not be overlooked as an option. At first blush, the Ninja Coffee CF09 32CF4 seems too good to be true. It makes decent coffee, with a whopping five brew settings plus six different sizes ranging from cup to carafe. More exciting, it comes with a built-in, removable, dishwasher-safe milk frother, exponentially increasing your hot beverage options. It uses only grounds – no pods or K cups – so you can feel better than your Keurig-using neighbors who are burying the planet in refuse. Alas, it is indeed a little too good to be true. There are rampant reports of the cleaning light going on, and staying on, despite Herculean efforts to clean it properly. (And don’t count on it to make good, or any, coffee after the light stays on.) Customer service in response is weak and makes you wonder why they continue to sell a machine with such a consistently reported defect. 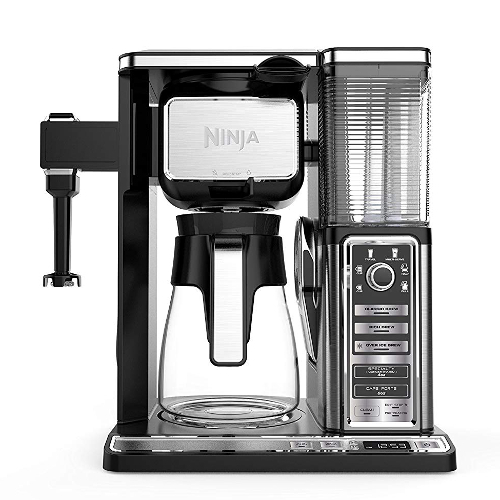 This Ninja will tempt you with this model and its promise of endless coffee fun, but it’s a bit of a gamble. 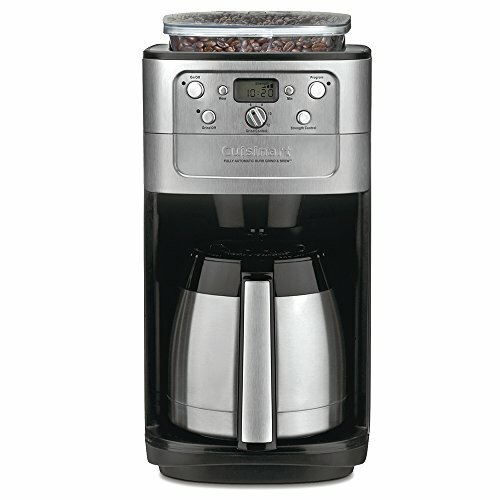 Unlike all our other reviews models, the Cuisinart DGB-900BC accepts only coffee grounds. And also unlike any of the others here, it has an onboard burr grinder, giving you the freshest coffee possible. 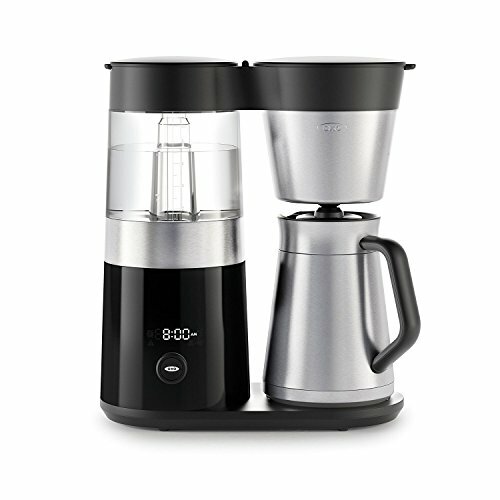 It’s programmable and its thermal carafe lets you make 2-12 cups. It doesn’t have a single serve option, but it does let you interrupt brewing to get that all-important first cup. But its distinguishing, defining feature – an onboard grinder – is also the source of the most complaints. As often happens when manufacturers try to combine multiple appliances into one, you’re left with something that doesn’t excel at any of them. The grinder clogs, spews, and leaks grounds on a regular basis, even for users that clean religiously. And the thermal carafe might keep the coffee warm (or might not, depending whom you ask), but it’s really hard to pour. Grind-and-brew is a terrific concept that is not well executed here. You just want a reasonably priced coffee maker that doesn’t cost a fortune. It shouldn’t be hard. After all, you’re only asking it to do one thing – make coffee. Since making coffee is not difficult or complicated – pour hot water over coffee grounds – these machines compete on the micro level. Speed. Coffee maker manufacturers pit machines against each other that measure brewing speed not in minutes but in seconds. Especially if you want a machine with single serve capacity, you can readily find a machine to do that about a minute. Gone are the days of waiting for an entire pot to fill. Tied into speed is a list of tiny conveniences that can add up to a streamlined, relaxing experience, or a frustrating bother. Does the machine make the coffee hot enough, or will you need to zap it in the microwave? Is it easy to add water, or do you have to contort yourself to get water into the machine? Does the coffee wind up in your cup or does it dribble on the counter? Does the coffee come out of the carafe at a normal speed, or does its slowness defy the laws of physics? These may all seem like petty points but remember that you are shopping for a machine that exists to give you the fastest, easiest coffee. When you don’t get the utmost in speed and convenience, the machine has failed at its primary objective – the easiest and fastest coffee, every time. If you wanted a 30-minute, 27-point ritual to make coffee, you wouldn’t be looking for a reasonably priced coffee maker. For speed, convenience, and reliability, the Keurig K575 can’t be beaten. Despite providing a mind-boggling array of hot beverage flavors, strengths, and sizes, a young child could set it up and operate it in minutes. This machine practically knows what you want before you do. If you’re looking for a Top Pick kind of experience at a fraction of the cost, you can’t go wrong with the Hamilton Beach 49976. You won’t have it forever, but while you do, you’ll be thrilled to know you got nearly all the qualities of a higher end machine at a fraction of the price. Cowboys used to boil coffee and water in a pot over a campfire and filter out the grounds with their teeth (according to lore, at least). You can now have coffee in seconds with the press of a button. We hope these reviews have “bean” useful and given you “grounds” to make the right choice.